A Species Account is a record of animal, plant or other nature observations. Since little is known about the majority of animal and plant species, almost any information is useful and valuable. The entries are geared toward recording phenology, ecology and behavior. In the Grinnell Field Journal System, the journal would narrate general observations. The species account would be for specific birds, plants, weather, rocks, etc, that you are focusing on. I have read that college biology students are required to make a detailed observation pages of all the plants and animals that they observe. For the amateur naturalist, that might be too much. Choose what works best for you. These entries are where observation of regularly or intensely studied species is collected in one place. This makes it easy to locate information on behavior, nesting, courtship, bloom times, etc. To be really valuable, the observations should be made at regular intervals. Professional naturalists plan out a schedule. Perhaps, a certain plant is scheduled to be observed every day at 10:00 am. Or a bird’s nesting behavior once a week. Having this information in one place saves hunting through nature journals to find out about a particular species. 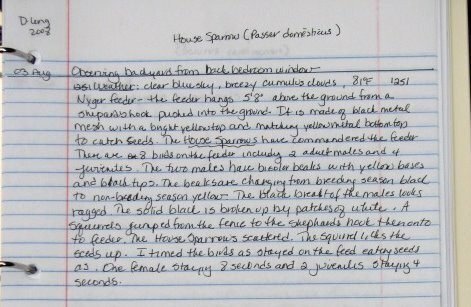 Say, you were asked to write a short article, poem, etc., for your nature club newsletter on the House Sparrows in your local area. Having detailed observations about the birds’ habits would make writing that article much easier. •For frequently traveled trails, use standard references or prominent landscape features. State the distance from the pond, the big red boulder, etc.